On Tuesday, April 4, 2017, Friends of Family Farmers will be holding our fourth biennial 'Family Farms Mean Business' Rally and Day of Events at the State Capitol in Salem! Join us in Salem for a day of education, action and fun! The Family Farms Mean Business event will include educational farm and food policy workshops, a mid-day Rally on the Capitol steps, an indoor 'farmers market' to promote the positive impact of direct marketing and small farms, meetings with Legislators, and more. 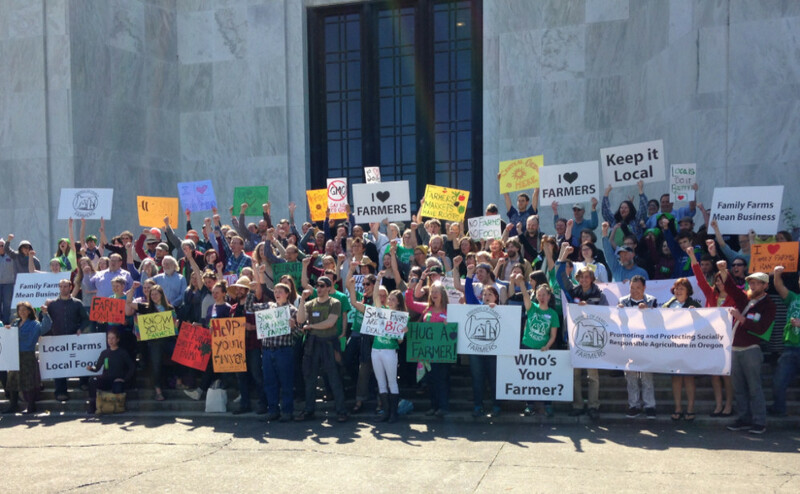 In 2015, more than 150 farmers, ranchers and local food/family farm supporters from every corner of the state came to the State Capitol for educational workshops covering the top farm and food priorities in Salem, to educate policy makers, and to Rally on the Capitol steps at mid-day in support of good policies that support small and mid-sized family farms, healthy local food systems and sustainable agriculture. Rally on the Capitol Steps 12:30 - 1 pm - Come one Come all! Spread the word to your fellow farmers and food advocates - we need to show our decisionmakers that Family Farms Mean Business for Oregon! Thank you for joining us at the Capitol on April 4! Your voice matters, and it is important for our representatives to hear from you, their constituents, that Family Farms Mean Business!